“Looking out at the waters of Puget Sound, you see the sunset, the beautiful mountains, and people think, ‘Everything is good, we’ve got the orca.’ But we have invisible problems,” says Chrys Bertolotto, natural resource programs manager at the Washington State University Snohomish County Extension office in Everett. Indeed, the region’s rich natural resources have attracted a booming population complete with homes, schools, industry, and the inevitable waste products they generate. Much of it, unfortunately, ends up in the Sound. At least 63,000 pounds of toxic chemicals each day. Before the passage of the 1972 Clean Water Act, unfiltered wastewater from smelters, pulp mills, and sewage treatment plants was freely discharged into the Duwamish River and other Sound waterways. Regulations and permits have successfully decreased industrial pollution but a dozen or so Superfund sites remain in remediation. With every rainfall, a toxic slew of animal manure, roofing materials, vehicle debris, home and garden chemicals, and sewage from failing septic tanks is washed down those conduits into the Sound. The estuary also suffers from a slow rate of water exchange, allowing chemicals and bacteria to linger in bays and inlets. It all adds up to an ailing ecosystem, with negative effects on plants, wildlife, and humans alike. Rivers and streams once thick with Coho and Chinook salmon now see a fraction returning to spawn. Bacterial contamination of shellfish beds and swimming beaches is common. Water supplies are vulnerable. 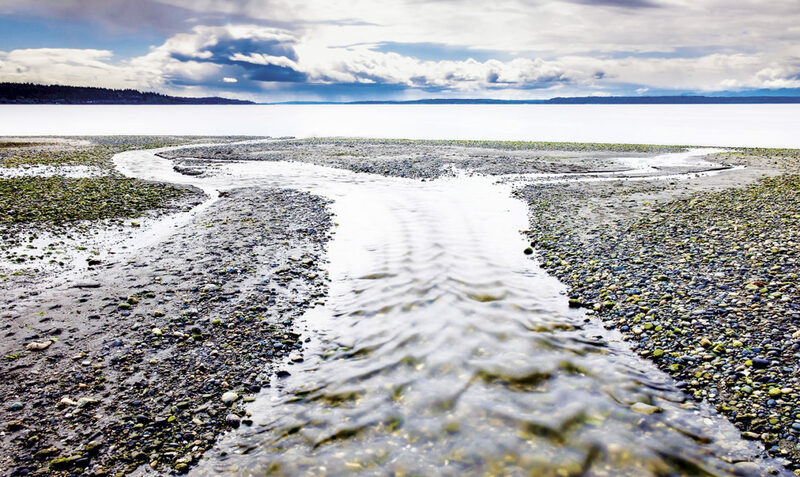 In 2007, an alliance of concerned citizens and organizations formed a state agency called the Puget Sound Partnership whose goal is to restore the Sound to health by 2020 and safeguard it for future generations. Their progress can be tracked by a “Vital Signs” wheel that colorfully highlights six major areas of concern, each with specific indicators of the Sound’s health such as eelgrass habitat and economic vitality. It’s an enormous undertaking that relies heavily on regional and local efforts. Hundreds of state, federal, municipal, tribal, and nonprofit organizations work together to keep recovery on track. Among those participating is WSU Extension. From Puyallup to Bremerton, Port Townsend to Everett, WSU Extension and research centers are immersed in Puget Sound revitalization through a combination of investigation, stewardship, and educational outreach programs. 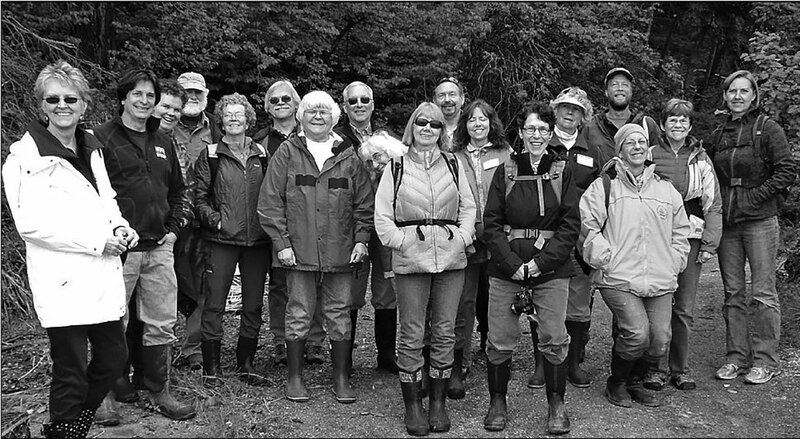 Bertolotto, who directs the Snohomish County Beach Watchers program, is just one of many Extension agents who use the latest scientific discoveries to design locally relevant community projects and train volunteers to become citizen scientists. It may be surprising that WSU, whose original campus is 300 miles away in dryland farming country, can be a partner in marine and freshwater recovery efforts. On a sunny day at the Puyallup Research and Extension Center, tulips and even the grass seem jubilant as John Stark walks out of the tidy brick admin building en route to his outdoor laboratory. The New York native and WSU professor of ecotoxicology is one of the original members of the Puget Sound Partnership Science Panel and helped design the Vital Signs wheel. The panel advises Partnership directors on the best ways to protect the Sound while improving ecosystem health. The panel was key in pinpointing stormwater as today’s biggest source of contamination. Much of that data came from the Washington Stormwater Center—a collaboration between WSU Puyallup and the University of Washington Tacoma since 2010. Stark, who directs the center, leads Puyallup researchers in the study of low-impact development emphasizing conservation and the use of natural features. Instead of traditional gray stormwater measures like pipes, sewers, and manholes, Stark’s team uses green stormwater techniques to slow rainwater runoff and allow it to filter naturally into the ground. “We’re studying things like bioswales—gently-sloped roadside drainage ditches—rain gardens, and permeable pavements,” he says. Permeable concrete and asphalt are made of porous materials that allow water to percolate through to the earth rather than glide over the surface. The materials also trap sediment and filter out pollutants. Stark says rain gardens use a similar principle. The shallow pond-like areas are filled with a mixture of soil and compost that filters runoff from rooftops, driveways, and other hard surfaces. He also analyzes roofing materials and the contaminants they release during storms. It all amounts to a recipe that takes a heavy toll on salmon and other aquatic species. The evidence was recently confirmed by Stark and aquatic toxicologist Jenifer McIntyre together with NOAA Fisheries and the U.S. Fish and Wildlife Service. Their studies showed that 60–90 percent of stream-spawning salmon like Coho die before laying their eggs due to stormwater pollution. “Untreated stormwater from Seattle freeways is extremely toxic to fish and the aquatic insects they eat,” he says. “But allowing water to run through rain gardens completely eliminates that toxicity. With continued funding from the Environmental Protection Agency and other organizations, Stark hopes to discover ever better ways to control stormwater. For example, using carbon fiber from jet wings to strengthen permeable pavements. His research findings not only impact state policy decisions but are also reflected in many Extension programs around Puget Sound. Set in the shadow of the Olympic Mountains, the Kitsap County Extension office in Bremerton is home to both WSU land-grant and University of Washington Sea Grant programs. Their mutual goal is to enhance public outreach efforts. “We have a unique partnership here—one of only a couple in the state to share an office and expertise,” says Renee Johnson, water stewardship program coordinator for Kitsap County Extension. 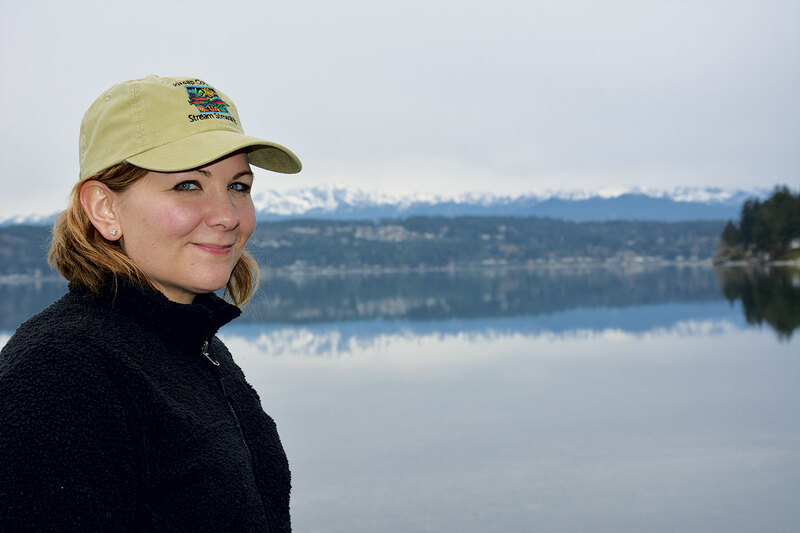 Her UW counterpart is Jeff Adams, a marine ecologist with the Washington Sea Grant program. He is also a coordinator for the Beach Naturalists program. That thinking is evident in the city of Silverdale, a mecca of low-impact development where rain gardens, permeable asphalt, and permeable paving stones are common and even adorn a local roundabout. The latest in green engineering techniques are also on display at the Clear Creek restoration site, where the long-neglected stream is getting a massive overhaul. Kitsap Extension supports these efforts through a palette of environmental stewardship programs. Stream Stewards, for example, trains volunteers to restore and monitor the health of freshwater habitats like Clear Creek. One way they do that is by sampling aquatic insects. The types and numbers they find are related to the amount of pollution in the waterway. “Stream bugs are a sentinel for stream health,” Johnson says. “If we find many pollution-sensitive species, like mayflies, it can mean the water quality is better.” It’s also better for the salmon who depend on those insects for food. In fact, monitoring bugs is an easy way to help gauge the general health of salmon populations. Clear Creek eventually empties into the estuary at Dyes Inlet on Puget Sound. It is here that Johnson visits homeowners with information about the Shore Friendly program for removing beachfront retaining walls known as bulkheads. “The shoreline is part of a delicate ecosystem and when it’s blocked with a bulkhead, it can’t function properly,” she says. Bulkheads are placed to prevent bluff erosion, but Johnson says the sea walls can actually increase beach erosion as well as disrupt natural shoreline habitat. Shade plants are lost along with terrestrial insects that feed juvenile salmon. Changes in beach sediment also block forage fish like smelt from spawning which leads to a subsequent decrease in the salmon who eat them. There, just below the water’s surface, hundreds of fluffy white anemones wave their tentacles. Sea squirts join a montage of feather duster worms, giant barnacles, sea slugs, and one red rock crab eating a mussel. Adams trains Beach Naturalists to trap and identify native crabs in hopes of finding and eliminating nonnative invaders. Just this spring, more than 50 green crabs were discovered near Sequim on the Olympic Peninsula. The fear is that, once established, the crabs could disrupt the Puget Sound ecosystem. 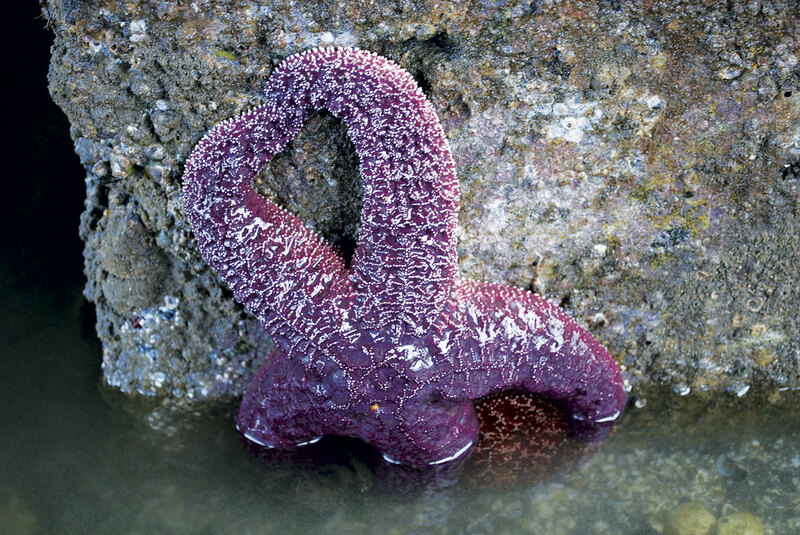 The paucity stems from a devastating viral outbreak of sea star wasting that began in 2013 and has killed many millions of starfish along the west coast. Although die-offs have occurred in the past, Adams says they were never of this magnitude. Researchers suspect warming waters played a role. “A year and a half ago, we saw lots of sea star babies and got excited but they all disappeared and we haven’t seen many since,” he says. “In the past, populations have recovered in a number of years. At the far end of the dock, he finally spots one lonely starfish clinging to a post—it’s a giant pink star, one of the largest species in the world. Near a beach in Port Townsend, the Jefferson County Extension office stands guard over Puget Sound like a blustery outpost. The white clapboard building is sea weathered and quaintly topped with a cupola. Inside, Bob Simmons, associate professor of water resources, pores over a map showing where he and his team have installed local rain gardens. Simmons’s office, like Kitsap Extension, places a major emphasis on stormwater management and watershed protection with programs specifically geared toward the needs of rural communities. Small hobby farms are common in Jefferson County and manure is easily washed into streams by rainfall. Rural areas also rely on septic systems of which 5–10 percent can be failing at any given moment, spilling coliform bacteria into waterways and eventually the Sound. “Government can’t do it all. It really needs to be addressed at the individual level if we’re going to make a difference,” says Simmons. It also takes an extensive partnership with nonprofit organizations, tribes, and local city and county governments. Those rain gardens, for example, were built with support from Master Gardeners, the city of Port Townsend, and the local Marine Resources Committee. 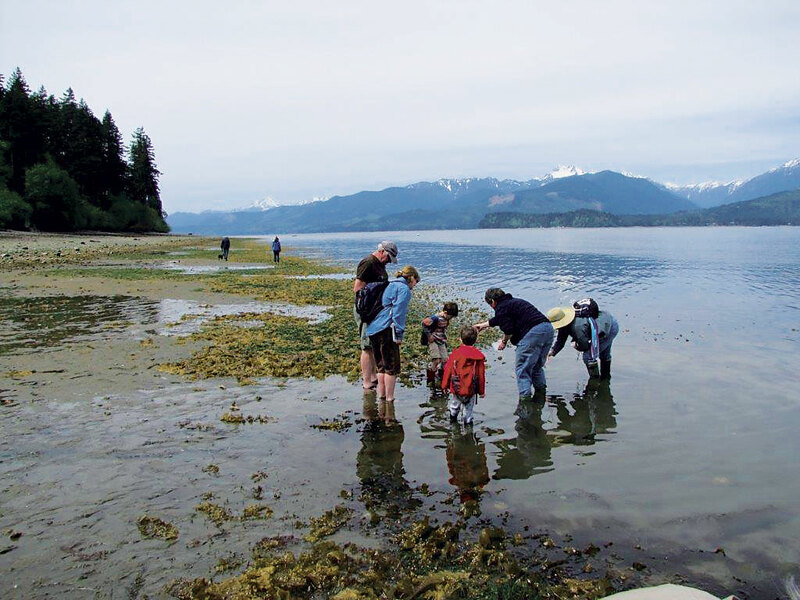 Like Kitsap County, they also offer a Beach Naturalists program, led by Cheryl Lowe. The six-week, entry-level course provides scientific training taught by regional experts. Once certified, trainees commit to 40 hours of volunteer service with local marine-related programs. Two of those volunteers, Amy Does and John Conley, are visiting the beach at Fort Townsend State Park. Both became Beach Naturalists in 2013—an adventure, they say, that enriches their lives and communities as well as the health of the Sound. 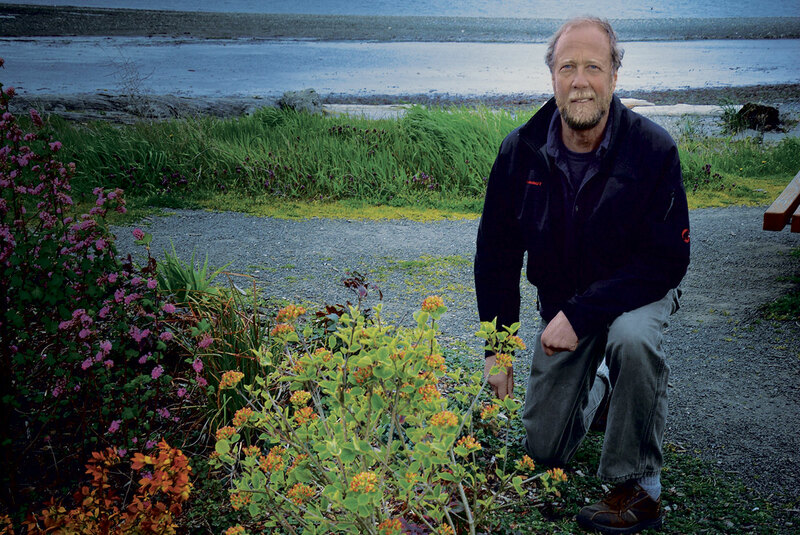 Does is a retired community college biology instructor who tackles projects ranging from green crab and sea star monitoring to forage fish egg sampling and Olympia oyster restoration work. “It only takes a few days a month. It’s not a huge commitment,” she says. One of the perks Does enjoys is meeting citizen scientists from all walks of life—IT, engineering, social work, and more. Each connects with a web of other volunteers to ultimately form a very large network. Conley, a retired public health director, puts his training to use as a docent at the Marine Science Center where he shares his enthusiasm for marine life with schoolchildren. He also works with SoundToxins, a monitoring program that gives early warning of toxic algal blooms. Puget Sound is home to several species of algae that produce poisons that can harm humans and wildlife. “The program augments the resources of local health departments,” he says. “We provide data that helps the department decide whether or not to close a beach to shellfish harvesting due to biotoxins. While Conley is analyzing plankton, Does takes part in a similar project with the Puget Sound Restoration Fund. She is on one of seventy teams that collect and test mussels for paralytic shellfish poisoning through the State Department of Health. She says volunteer help is critical to effective widespread monitoring. In Edmonds, Snohomish County Extension volunteer Rick Albright swaps a federal science career for his new role as a Beach Watcher. To say he’s enthusiastic is an understatement. Recently retired, Albright was a staff biologist at UW before joining the Environmental Protection Agency Region 10 office in Seattle, where he directed the hazardous waste program and, later, the Superfund program which oversees the Lower Duwamish Waterway cleanup plan. The program is directed by Bertolotto and coordinated by Yolimar Rivera Vazquez. Beach Watchers is a step up from Beach Naturalists, with volunteers receiving an extensive, 80-hour training course. They also agree to 80 hours in service over the next two years. Albright volunteers on “beach patrol” where he tells stories and answers questions about things like sea star wasting and ocean acidification. He also maps profiles of intertidal beaches, monitors water quality, and conducts rain garden assessments. He and Bertolotto also hope to team up with UW to study eelgrass, a Vital Signs indicator for healthy marine habitats. The aptly-named sea grass grows near the shoreline, providing an important food source for tiny organisms as well as cover for juvenile salmon, molting crabs, forage fish, and more. 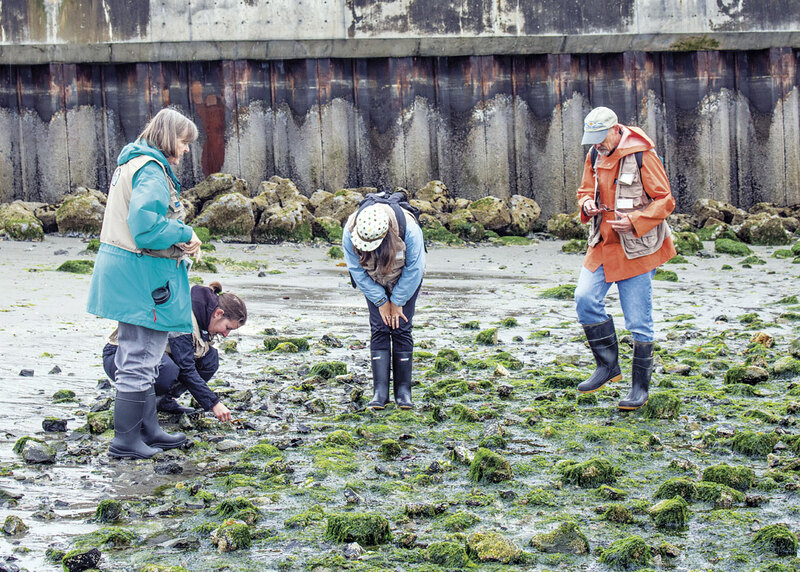 Bertolotto says one of Beach Watcher’s main priorities is to introduce people to the outdoors, especially the intertidal areas where volunteers explain the beach creatures, their life cycles, and environmental sensitivities. “We’re hoping to build a lifelong love and appreciation for Puget Sound and its resources,” she says. That includes story time and activities for children. “Research shows that preschool is the age when humans start making connections to the outside world, so it’s an important age to reach out to,” says Bertolotto. Indeed. Big hands, little hands. All lifting, measuring, teaching, counting, repairing, cleaning, building, planting, healing. The work is far from over. In the latest Vital Signs report, statistics show that Puget Sound interventions have made some progress, at least on local levels. Several indicators have improved, but others, such as salmon and orca populations, remain uncertain or in decline. Unfortunately, few indicators are on target to meet their 2020 goals. Guardians of the Sound are more crucial now than ever. Bit by bit, their hands help stem beach erosion so surf smelt can spawn in the sand. Watershed creeks are restored and more salmon survive the trip upstream to nest. 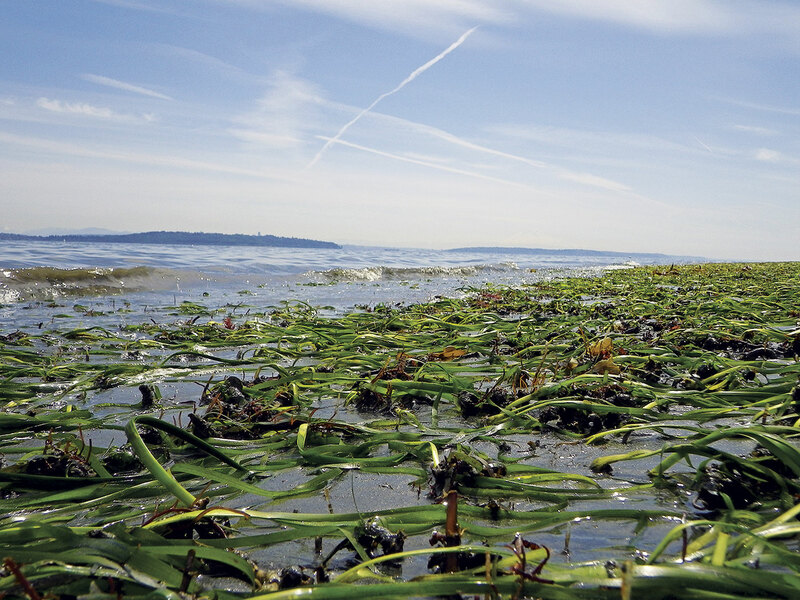 Shellfish harvests stay open a few days longer and crabs can safely molt in the eelgrass. The efforts accumulate and with enough time and care, even the sea stars could return to brighten the rocks and pilings of America’s second largest estuary. Streaming views: Over 500 streams and rivers (and thousands of other inflows) enter Puget Sound. View four of them close-up as they make their way into the second largest estuary in the United States.